Genre painting made a comeback during the late nineteenth century in France, where eager patrons searched for images reminiscent of another time. Some were also looking for more humorous depictions which lightly poked fun at some established members of society, such as the clerics. 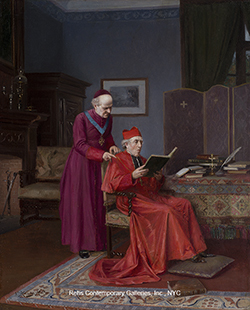 Victor Marais-Milton spoke to both audiences, occasionally depicting a stroll in the park, but also finding considerable humor in the life of the clergy. His genre paintings have meticulous sense of detail which imbues them with qualities of reality sufficient to fully document the subtly comical exploits of his subjects. Victor Marais-Milton was born on July 21st, 1872 in Puteaux, located just west of Paris on the Seine River. Early in his career he lived in Paris but later moved to Sèvres where he remained until his death. He studied in the atelier of Jonchère, but has also been linked to Ernest Meissonnier, who by the end of his career had become a master of genre painting and an inspiration to many artists while working as a teacher in his own atelier for the École des Beaux-Arts. But this was a period when different styles were emerging, each taught by various masters at different ateliers. Quarreling factions grew up among the different teachers, one of which was between the “Bouguereauistes,” those working in the tradition of William-Adolphe Bouguereau, and the “Meissonnieristes,” those, like Marais-Milton, who were trained under Ernest Meissonnier. This became one of the great competitions between two ateliers steeped in the academic tradition. Even if Marais-Milton was not directly involved in Meissonnier’s atelier, he still worked in a style that was very similar to his and his students. 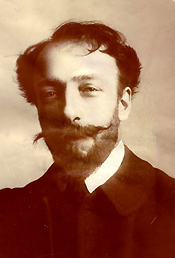 Working as a “Meissonnieriste” was not harmful to his public career which began at the 1898 Salon where he submitted a portrait of Mademoiselle Marguerite Picard of the Opera, at which time he had not yet begun his training with Jonchère. From then on Marais-Milton was mysteriously absent from many of the Salons during his early career. It was not until 1909 that he began to exhibit more consistently. But one must add, at this time Milton was exhibiting with the most conservative Salon groups, shunning the Salon des Independents and remaining oblivious to the achievements of the avant-garde. The popularity of these themes is related to the contemporary social, political, and cultural trends of the era. Both Meissonnier’s and his followers’ evocations of an age of cavaliers and guardrooms mirror not only the growing taste for Dutch art but also what Hook and Poltimore refer to as ‘the development of the historical novel as a popular literary form. Nineteenth century France also nurtured a fascination in previous periods of their history, and artists took advantage of this in their evocations of bygone eras. 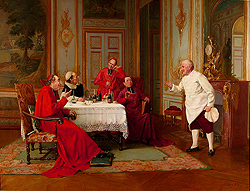 This took several forms ranging from artists such as Henri-Victor Lesur who depicted beautifully-adorned women reminiscent of those found in Jean-Antoine Watteau’s paintings of the eighteenth century, to other works such as Marais-Milton, Jehan-Georges Vibert, and Meissonnier who treated religious subjects. Relevant to the increase in religious images, anticlericalism had been growing since before the French Revolution. 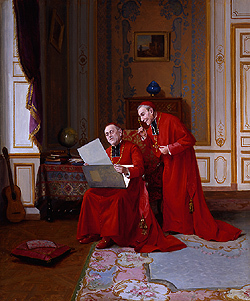 As the twentieth century approached, it was almost an established trend to mock this institution and its representatives, thus providing artists with the opportunity to create satirical images of clerics. Artists began to establish these images as an accepted form of art, made easier by graphic artists such as Honoré Daumier who also created images of amusement, though more politically-oriented, in the many illustrated journals of the period. Thus, images such as these were widely disseminated to the masses and fully understood by those who were viewing them. 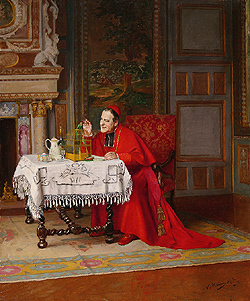 The domestic antics of members of the higher echelons of the Roman Catholic Church exercised a powerful fascination for a number of popular painters and their patrons in the second half of the nineteenth century. 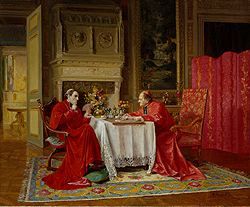 These intimate scenes, set behind closed doors of the private quarters of a cardinal’s palace, constitute a clearly-defined genre of painting in their own right. 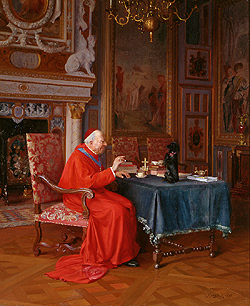 … But to understand the original motivation behind this choice of subject, one must not overlook the element, present in varying degrees in most such works, of anti-clericalism. There is no doubt that contemporary collectors and spectators took great pleasure in the sight of noble figureheads of the church reduced to banal, even undignified proportions. The comedy was appealing, and the anti-clerical message suited the prevailing political mood of the buying public. Marais-Milton’s images showed a fine attention to detail in every aspect of the paintings. At some point in Marais-Milton’s career, it is not fully known when, he established a studio in the floor of his house in Sèvres which had a large window which allowed a flood of light to illuminate his subjects, many of which are seen posed against the window or at least illuminated by light coming from it. He would use models, whether his maid, neighbors or Italian faces especially for his ecclesiastical subjects, to compose the layout, dressing them in suitable clothing which would then be in his paintings. Some of the furniture that was housed in his residence in Sèvres was also featured in his paintings. He stayed at this studio all his life, remaining true to this type of art with its precise rendering of detail despite other creative advances of the time. Along with his achievements at the exhibitions in Paris, the artist found great success in Monte Carlo, London and the United States. He also exhibited at the private galleries of Allard and Simonson, as well as at provincial Salons such as those in Mulhouse and other international showing such as in Antwerp. According to family records, Victor died in Sèvres in 1944, fatigued from the war which had exacerbated his already fragile health condition. 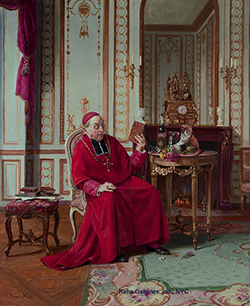 Whether it was Parisian leisure scenes or humorous depictions of the clergy, Marais-Milton’s images satisfied the rekindled desire for genre painting in the late nineteenth and early twentieth century France. It was equally popular in America where they eagerly collected this type of work. His sensitivities to detail and to a constructed veracity allowed viewers to engage with his subjects and earned him a place in the history of genre painting, even during a period of time when genre painting was no longer valued at all and was often seen to be regressive.